Whenever you eat pie, doesn’t ice cream usually accompany it? 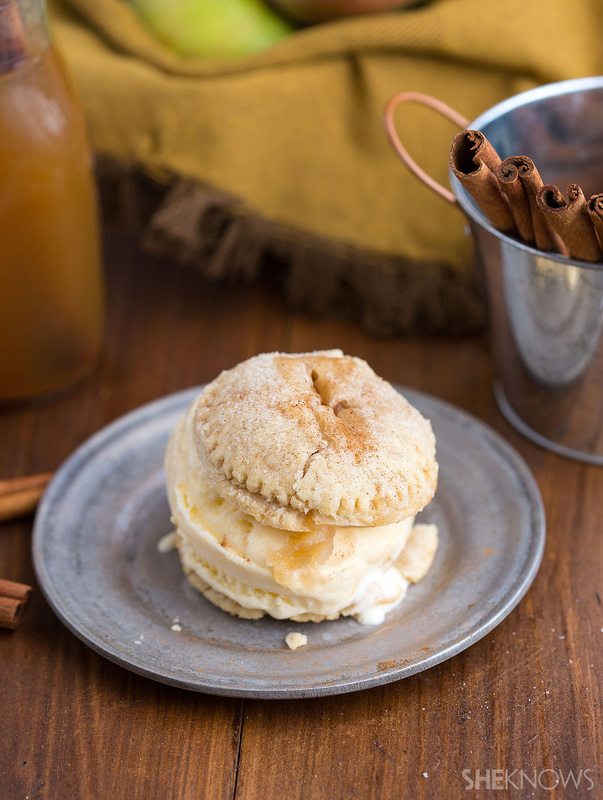 With these delicious apple pie ice cream sandwiches, you can have your pie and ice cream all in one delicious bite. 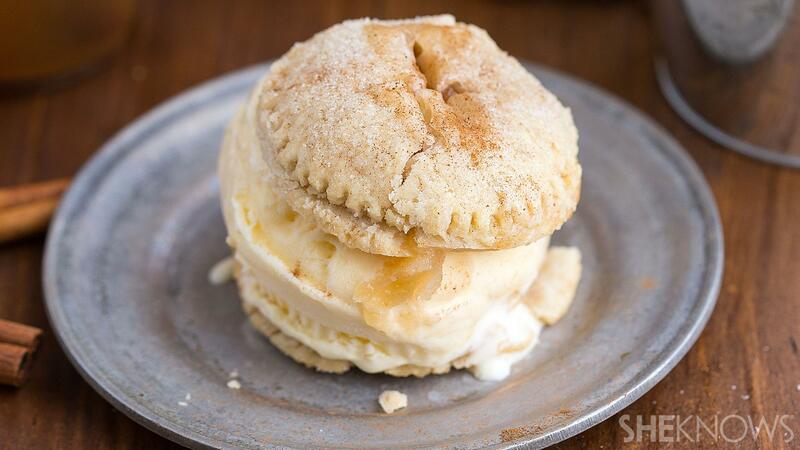 To create pie ice cream sandwiches, you’ll need to start off by creating miniature hand pies. To create hand pies is simple, but takes some planning ahead since they need to be completely cooled before placing the ice cream in the pies. I made a homemade pie crust because to me they are the best and no store crust can compare. However, if you are looking for an easier recipe, a store-bought crust will definitely work too. Using the top of a jar or a circle cookie cutter, cut out dough in the shape of circles. Place the circles on a tray lined with parchment and then spoon some pie filling onto the dough. You can use whatever pie filling flavor you would like or even use a homemade one. I used a store-bought apple pie filling for this recipe. After spooning on the apple pie filling, place one more crust on top of the other crust and crimp the edges by using the ends of fork. Press the fork down into the two pieces of the dough to firmly seal the hand pies. After an easy egg wash and a light sprinkling of sugar, these hand pies get baked for 12-15 minutes. Then remove from the oven and allow the pies to completely cool. Meanwhile, prepare the ice cream centers. Line a Mason jar or shallow baking cup with plastic wrap or tin foil. 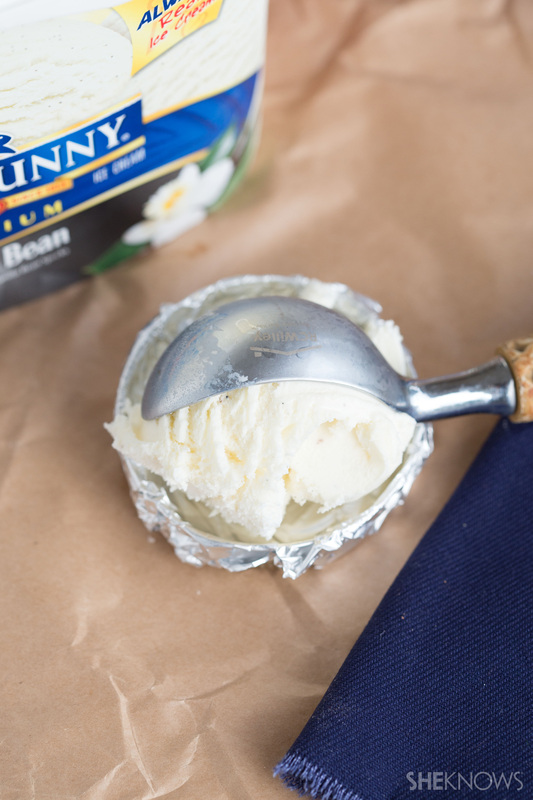 Scoop slightly softened ice cream into the cup or jar and press it down, smoothing the top. Place the ice cream in the freezer to harden again. Once the pies are cooled, place the ice cream center on one pie and peel off the aluminum foil or plastic wrap. Place the other pie on top and enjoy immediately. These are sure to be a new favorite dessert. This apple hand pies are so easy to make and such a fun way to serve pie with all the fresh fall apples that are in season right now. Although this tutorial teaches how to do a homemade pie crust, you can always use a store-bought one making these hand pies even easier. Combine flour and salt in a medium-sized bowl. Add shortening in small cubes. Cut the shortening in with two knives until you get pea-sized pieces. Stir in the water and then knead the dough. Roll out the dough and cut out circles. Place about 1/2 tablespoon of apple pie filling in the middle of half of the circles. Top the apple pie-filled covered circles with remaining dough circles and crimp with a fork to seal. Slice an X shape in the top of the pies and then spread a lightly beaten egg white over the pies with a pastry brush. Sprinkle sugar lightly over the top. Bake in a 350 degree F preheated oven for 12-15 minutes. Remove and allow to completely cool. Place ice cream in between two pies and enjoy immediately. Check the notes for an ice cream tip.